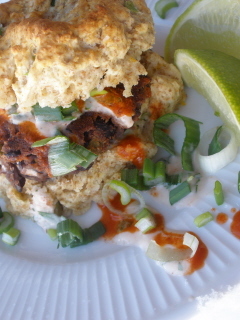 These petite black bean patties are incredibly satisfying and hearty, especially when accompanied by yogurt biscuits containing corn and green onion. You may even get the meat eaters in your family to forget about the lack of meat! 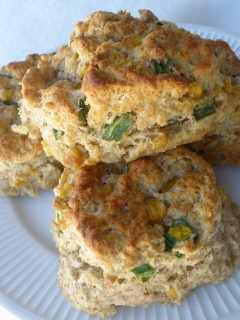 yogurt biscuits - added ½ cup frozen corn, and ¼ cup sliced green onions to the batter before baking. Follow biscuit directions and ingredient list according to La Fuji Mama don't forget to add the corn and green onion to the batter. Preheat oven, and place biscuits on baking sheets ready to go in the oven. Don't put them in quite yet. For yogurt sauce combine yogurt, hot sauce, lime juice, and cilantro in a small container. Refrigerate in air tight container until time to serve. In a medium sized mixing bowl add black beans. With the back of a fork smash about ¾ of the beans into a paste. Add to the bowl cumin, garlic, green onion, and jalapenos. Form beans into 6 patties, the same diameter of your biscuits. Set aside. Pop biscuits in the oven now. In a medium sized skillet heat EVOO over medium heat. Once hot, add bean patties and cook until browned about 5 minutes, flip and brown the other side. Serve immediately on hot biscuits, garnish with yogurt sauce, green onion and a lime wedge.